What Purpose Will a Congress-RSS Dialogue Serve? Is a discourse possible with a decentralised enterprise like the Sangh Parivar in an atmosphere that has emboldened self-declared protectors of our 'national traditions' who work on their own whims and fancies? Dialogue seems to be the apparent mantra to reconcile two divergent opinions. At the same time, reducing dialogue to a binary of popular extremes obfuscates the overlapping complexity between the two. Moreover, the discourse becomes limited insofar as to lump all counter arguments coming from various ideological sources under the two broad umbrella categories at hand. This very much seems to be the case where there has been a 'liberal' urge for a dialogue between the Congress party and the Rashtriya Swayamasevak Sangh (RSS). After veteran Congressman and former Indian President Pranab Mukherjee's visit to the RSS headquarters in Nagpur in June this year, there is a talk of inviting Congress President Rahul Gandhi in a lecture series planned by RSS supremo Mohan Bhagwat. Lending credence to this 'possibility of reconciliation' is, Sudheendra Kulkarni, an aide of former Prime Minister Atal Bihari Vajpayee, who believes that a lot that can be achieved between these two groups in terms of a constructive dialogue. It becomes imperative to understand this sudden insistence on a dialogue with the RSS, especially in a context where the RSS is being painted as a cultural body that is becoming more inclusive in terms of its composition and also as a moral, ethical organisation that is working hard to jettison rogue, lumpen elements out to tarnish its image. Kulkarni's words raise more eyebrows than answering any of the established imagery of the RSS of being anything but inclusionary. He says RSS is beginning to embody a good bit of India's moderating diversity, forcing it to revise many of its rigid standpoints on language, caste and even religion. Reality has forced it to abandon its advocacy of Akhand Bharat. Hindutva will be forced to become liberal and integrationist. (Emphasis mine ). These are astonishing claims to be made when all that the history of the RSS provides us with is a visceral hatred for the cultural other, a complete disregard for the constitutional values, a deep disquiet and contempt for an individual-centric notion of life and living and a cultural hegemony that seeks to muzzle all voices or erase any religious bearing that goes against their idea of 'nationalist traditions'. Is a meaningful dialogue genuinely possible when the discourse being weaved, as Kulkarni himself does, is about how our attention must be focused on "real" issues of economic development, unemployment and so and so forth? Do we discard the increasing problem of rising communalistic tendencies that have managed to reach the confines of our personal lives with what historian Gyanendra Pandey calls Routine Violence? 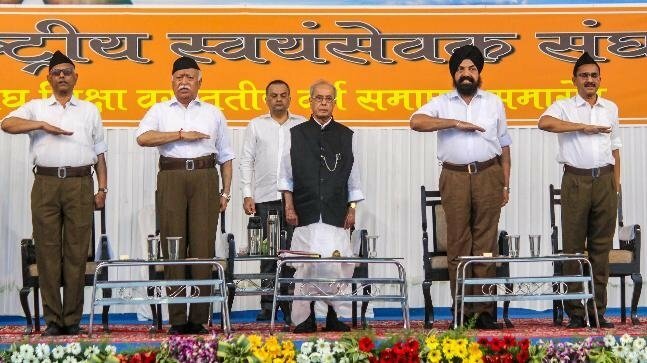 Perhaps, it is more desirable to view all the speeches made by Mohan Bhagwat in the recent past to understand their steadfast adherence to the principles cherished by RSS’s founding fathers -- Golwalkar and Hedgewar. If Kulkarni requires a reminder of a more dramatic exposition of what the RSS has always stood for, he must watch BJP National Secretary Ram Madhav's interview to Mehdi Hasan which was aired a few years ago on Al Jazeera exposing the RSS talk of peace and inclusion . This insistence on seeing the RSS in a more positive light has come from both within and outside the organisation. Arun Kumar, RSS prachar pramukh, castigated Rahul Gandhi recently by saying, "One who doesn't understand India cannot understand the Sangh". This phraseology sounds eerily similar to a popular right wing adage suffused with a colonial mind of, "One who doesn't understand Hinduism cannot understand India." He then went on to express their committed belief in Vasudhaiva Kutumbakam (All world is one family ) but the same body is otherwise known for instance to address the tribal population as Vanvasis and not Adivasis, the original inhabitants of this land. This is certainly not a one off example, as RSS has always believed in allowing worshiping of any religion as long as it is done within the framework of Cultural Hinduism and how they must respect 'national traditions'. When this is the underlying edifice on which their cultural unity seems to have stood for years, will a dialogue be entertained which is eventually going to move toward its exclusionist core of its foundational philosophy? Is a dialogue possible with an effectively decentralised enterprise like the Sangh Parivar in an atmosphere that has already emboldened self-declared protectors of our 'national traditions' who work based on their own whims and fancies? Arguably, to make a case for the futility of a dialogue with the RSS is more complex in the practical domain as their historical allegiances would suggest, starting with the Congress itself. More than the cryptic outsider's views on the dubious double membership of the RSS and the Congress, the people in the RSS who have written on this relationship and many other issues make a fascinating read of their inherent political mind couched in a cultural resplendence. One of the interesting books is The RSS Story by a long time member of the RSS, K.R.Malkani. He not only talks about the dual membership issue of Congress and the RSS in glowing terms but also buttresses the point of how a tacit understanding was always there between the two when it comes to not directly targeting each other, either politically or in the cultural domain. At the same time, such books also serve as a reminder to the RSS itself which has tried more vehemently of late to distinguish themselves completely from the Hindu Mahasabha. In the book, there are references where Malkani quotes Golwalkar and Shyama Prasad Mukherjee,for instance, in talking about the shared goal of the Hindu Rashtra of both the RSS and the Mahasabha and how the Constitution has failed to realise and state the Bhartiya Nationhood. In our quest to have a dialogue with the RSS, is it possible to make any sort of progress when it refuses to own up its own relationship with the dark history of the Hindu Mahasabha? Would the organisation acknowledge the relationship between Savarkar and the RSS or, for that matter, Savarkar and Nathuram Godse? Can we ignore the interview Gopal Godse gave after Savarkar's death about Mahatma Gandhi’s killer Nathuram Godse's connection to the RSS and his deep admiration for Savarkar? Or how he termed Nathuram Godse as the baudhik karyavah of the RSS? How do we look at Hedgewar's brief tenure as the secretary of the Hindu Mahasabha? What about Babarao Savarkar's (V.D.Savarkar's brother) role in helping RSS expand in Western Maharashtra? Even the wording of some of their forefathers sounds very similar to the pitrabhoomi and punyabhoomi idea of Savarkar. Consider the speech by Golwalkar in 1960, later published as a pamphlet called 'Why Hindu Rashtra?' where he characterised Muslims, Christians, Jews and Parsis as 'guests, but they are not the children of the soil.' If these communities are not going to be treated as the children of the soil, what is the purpose of this desperate call for a dialogue? Who is this going to help eventually? These questions and many more in the practical realm have always steadfastly refused to be commented upon by this organisation. Like its relationship with the Congress, RSS’s dealings with the Mahasabha have been deliberately kept ambiguous as it suits them as well as these other two organisations in keeping their favourable past encounters at bay. When history poses discomfiting questions like these, what purpose will a dialogue serve between two bodies who happen to share one major thing between them - a perceptive evasion of complexities. Another obsession of the RSS has been to distinguish between religion and culture. By invoking the latter as a much bigger category encompassing every walk of life, religion and its potential polarising role are almost made to seem inconsequential. Even if we go by a general definition of culture as activities beyond our primary biological functions, religion certainly plays a crucial role in shaping the adaptive ability of the mankind in relation to the given environment. In the present day context, we are made to believe that cultural unity will act as a panacea for the deeply religious fractured society of ours where this proposed 'culture' had absolutely nothing to do to the present condition of the society. As Noorani says in his book , "For the RSS, politics is to be conducted as one of the commands of the religion". Surely after almost 95 years of its existence, this is the bare minimum we as concerned citizens can know even without the proposed docile formality of a dialogue. On the contrary, to expect change, acknowledgement, remorse from an entity that old, is wishful thinking. Surajkumar Thube has done his Masters in Political Science from Jamia Millia Islamia, New Delhi, and close observer of contemporary Indian politics.